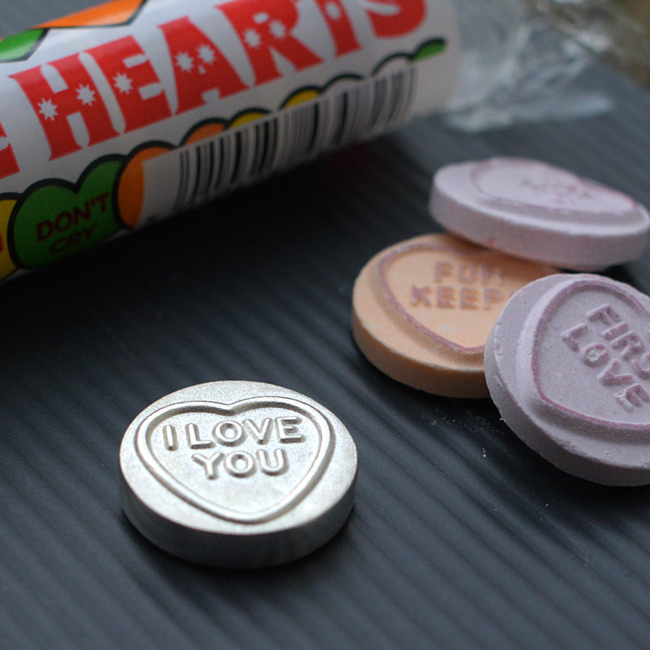 The solid sterling silver Love Heart is an exact replica of the Love Heart sweets that we all enjoy. It is a perfect gift for men or women and can be given for birthdays, Valentines day, Wedding days or even when you pop the question! Comes with a FREE packed of Love Heart Sweets. Option to engrave on the back. Availability: In stock Size: N/A Categories: All Jewellery, Necklaces, Commissions, Wedding Jewellery, Wedding Gifts. Tags: bespoke silver, engraving, free love hearts, free sweets, hand engraving, handmade silver, jewellers, jewellery, jewellery designer, jewellery maker., liverpool, love heart, LWSilver, north west, silver, silver love heart, silver love heart jewellery, silversmith, sterling silver love heart, the perfect valenties gift, uk, valentines gift, wedding rings, wirral. I bought this for my wife’s Xmas and hid the silver loveheart in a packet of the sweeties. I had to wait anxiously for a few days before she decided to open the packet. She really loved the surprise! Great idea, thanks LWSilver!